- USD slips after Fed minutes confirm 2019 rate hikes off table - for now. - Incoming data to either vindicate or rebuke the Fed's Jan-March u-turn. - Movements in the U.S.-Europe growth differential key to USD direction. The Dollar slipped lower during morning trading Thursday after minutes from the latest Federal Reserve meeting appeared to confirm that the central bank is unlikely to raise its interest rate at all in 2019, although some analysts are still tipping the greenback for fresh gains this year. Minutes of the Federal Reserve's March meeting showed officials fretting about the outlook for global economic growth which, given an easing of U.S. inflation pressures, was enough to have them continue the interest rate u-turn that began in January. "Members agreed to be patient" as they determine "what future adjustments" to the Federal Funds rate may be required up ahead in order to keep inflaiton in check. However, there was no discussion of interest rate cuts, only "several participants who noted" that their views on rates could move in either direction. "The minutes of the Fed's last meeting reinforce the patient stance of policymakers, but did little to justify market expectations for rate cuts. Indeed, most participants did not expect the acute economic weakness observed recently to persist beyond the first quarter, though they did concede that growth is likely to step down from last year," says Royce Mendes, an economist at CIBC Capital Markets. "Overall, the majority of members see rates stable for the remainder of this year." Federal Reserve rate setters moved to the sidelines in January after an economic slowdown in Europe and China, as well as volatility in emerging world financial markets, stoked concerns about the U.S. economic and inflation outlook. Those concerns endured into March and could remain alive for a few months yet. The ideaback in January was that, if the global economy slows over the coming months then it's only a matter of time before the U.S. economy and inflation outlook also weakens. And policymakers were already anticipating at least a modest slowdown in 2019 as the boost from President Donald Trump's 2018 tax cuts fades. Now, it could take at least until May before Federal Reserve officials will have a clear idea of the U.S. economic performance in the first quarter and at the beginning of the second. Markets will be watching incoming economic data for signs of movement in the "growth differential" between the U.S. and Europe. 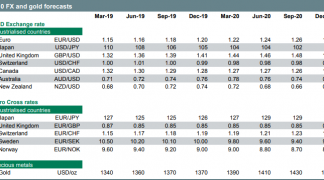 "Relative growth differentials and sentiment have dictated terms in global FX markets this month," says Ellito Clarke, an economist at Westpac. "US growth outperformance, both with respect to potential and against key trading partners such as Europe, is central to this US dollar rally." Clarke and the Westpac team forecast a new high of 98.50 for the Dollar index this year, based upon their expectation of a further economic slowdown in Europe and a relatively steady performance from the U.S. economy. He says the Euro-to-Dollar rate should fall to 1.10 later in 2019. In an environment where multiple central banks are contemplating renewed policy support for their own weakening economies, resilience from the U.S. might give rise to speculation of further rate hikes over the coming months and could easily keep the 2018-2019 Dollar rally alive. The European Central Bank is after all on the verge of offering the continent's commercial lenders another round of super cheap funding, while central banks in Australia and New Zealand have both hinted they could be consider interest rate cuts in the months ahead. 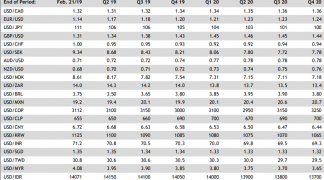 However, it might take a slowdown in U.S. growth combined with a simultaneous pick-up in other economies to truly undermine the big Dollar, which was the best performing currency in 2018 and sits around the middle of the G10 league table for 2019 thus far. "Policymakers are happy that their about-turn in January helped trigger a clear improvement in financial conditions but some, at least, are concerned about the danger of being boxed-in," says Ian Shepherdson, chief U.S. economist at Pantheon Macroeconomics. "In other words, they are happy to be seen as “patient” for now, but they are cognizant of upside risks to growth and inflation." Shepherdson says U.S. wage growth, which has been in excess of the 3% threshold for some months now, will rise even further in 2019 thanks to a strong labour market. This could stoke market expectations of higher inflation and compell the Federal Reserve to hike its interest rate again sooner or later. The Dollar index was quoted -0.06% lower at 96.89 Thursday but is up 0.91% for 2019. The Pound-to-Dollar rate was -0.25% lower at 1.3066 but has risen 2.5% this year, while the Euro-to-Dollar rate was 0.01% higher at 1.1275 but is down -1.7% for 2019. The Fed suggested strongly in January that its interest rate hiking cycle could now be over when it dropped the staple line from its statement that had said "further gradual increases" in interest rates would be required over the coming quarters to keep inflation in check. Fed officials replaced that forward guidance with language that suggested they're no longer sure that they'll even need to raise rates again. Then in March the bank's so-called dot-plot showed policymakers anticipating only one more interest rate rise this cycle, which was penciled in for 2020. Previously the dot-plot had indicated two rate hikes were likely for 2019 and another in 2020. Since then investors and analysts have begun to suggest the Fed could end up cutting rates once into 2020 because of an anticipated slowdown in the domestic economy. 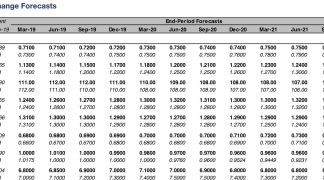 "We have long expected that weaker growth would convince the Fed to reverse course with 75bp of rate cuts by the middle of 2020, with the first cut probably now coming before the end of this year," says Andrew Hunter, an economist at Capital Economics. U.S. growth was lifted by tax cuts last year but there's no stimulus planned for 2019 to help the economy to surmount the hurdle set for it in 2018. "We think the broad USD has peaked and should begin declining soon. There are signs that the global economy is not only stabilizing but rebounding are growing, as seen in China PMIs and global trade volumes. 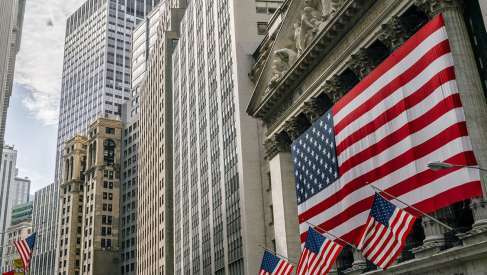 Meanwhile US data continue to soften and US nominal and real yields remain under pressure," says Gek Teng Khoo, a strategist at Morgan Stanley. "DXY faces resistance at the previous high of 97.10." If the Federal Reserve minutes, or weaker economic data, were to encourage further speculation of rate cuts up ahead then it would undermine the Dollar, but anything that suggests the above interest rate differential is here to stay for a while could ultimately see the greenback remain supported for a while yet. "We have tempered our expectation for a weaker USD this year. Instead we think risks are balanced and largely two-way for most major currencies in the months ahead. This suggests range trading could continue until fresh catalysts emerge," Ned Rumpeltin, European head of FX strategy at TD Securities.